A few days ago, I conducted a scientific analysis of my movie reviews over the last year and determined that the top week (in terms of average review) was the 5th to the 11th of November. However, if I'd waited until today, I would have found a new champion, as the average score this week comes in at a whopping 8.2. I think we can chalk this exceptional week up to a combination of seasonal cheer and the fact that due to delays in the Christmas post, my selection of new films from LOVEFiLM never arrived, so I watched a couple of old favourites instead. Anyway, on with a quick round up of this week's movies. 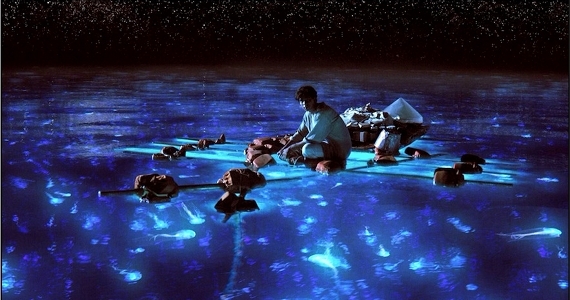 First up, Ang Lee's adaptation of Yann Martel's Booker prize winning novel, Life of Pi. It's the story of Pi Patel, an Indian lad of about 17 or so who survives a shipwreck, only to find himself floating across the Pacific Ocean in a lifeboat with only a tiger named Richard Parker for company. I was a little conflicted about this picture. On the one hand, it features some of the most strikingly beautiful cinematography that I've seen all year - in particular, certain scenes in which Lee pans back to reveal the night sky reflected in the calm ocean are quite breathtaking. As well as this, newcomer Suraj Sharma gives a highly impressive performance in the title role - something which is essential to the success of the movie, as for the majority of the running time, he's acting opposite a CGI tiger as the only human presence on screen. On the other hand, despite the fine central performance and the wonderful cinematography, I felt the pacing of the movie was a little off. It takes a while to get going, and other than the shipwreck (which, I have to admit, is thrilling), it proceeds at a pace which might generously be described as 'meditative'. I wouldn't say I was bored during Pi's long, arduous journey - but I wasn't exactly glued to the screen either. Moving on, I also caught Martin McDonagh's new film at the cinema this week. Seven Psychopaths is set in Hollywood, with our protagonist an Irish writer named Marty (presumably McDonagh didn't have to look too far for inspiration there). As the film begins, he's struggling to come up with a new screenplay; though he has a title (Seven Psychopaths), he's trying to avoid writing the same old cliched, violent story and is unable to make any progress. Luckily, his best friend Billy - a part time actor and full time dog kidnapper - is able to introduce him to a range of real world psychos just dying to appear on screen... McDonagh has followed up In Bruges (which I watched for the second time this week) with another fine picture. It's sharply scripted, witty, violent and features some fine comic turns from a number of great actors including Christopher Walken, Sam Rockwell, Woody Harrelson and Tom Waits. 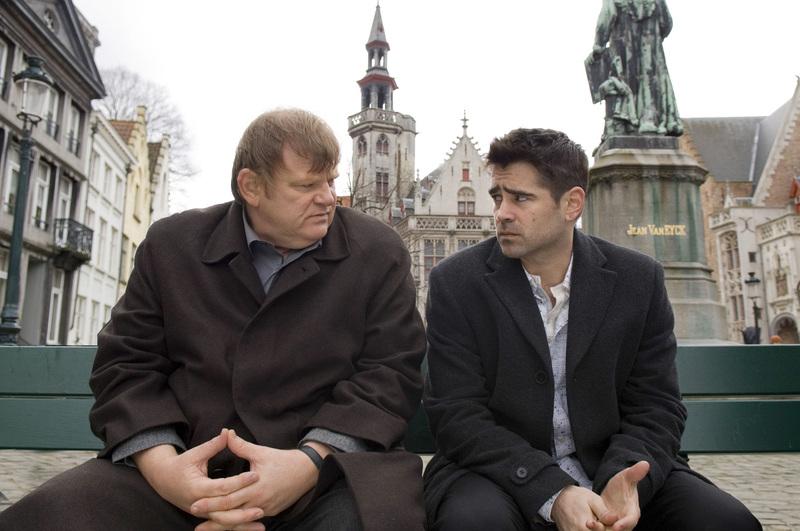 Nevertheless, of McDonagh's two films, I'd have to rate In Bruges a little higher than the follow up. That film's great strength is that in amongst the funny, profane script, the gunplay and the bizarre situations involving loquacious Eastern European gangsters and midgets dressed in school uniforms, we have two well developed lead characters that you come to care about during the course of the picture. Though Seven Psychopaths is similarly sharply scripted, it's endlessly self-referential nature (with nods and winks to the viewer) means that you're always aware that despite all the wit on display, the characters in the story are just that - fictional characters. It's inevitable, therefore, that the events which occur during the film's violent climax never have the same impact as the denouement of In Bruges. And finally, just a few words on the subject of The Big Lebowski, which I watched this week for what must have been the seventh or eighth time. I've talked about it before on this blog (for example here and here), but it really is just a brilliant film, one I can return to again and again. It's a movie which has, rather like The Simpsons, become almost a part of me; I'd say my brain consists of approximately 45% Simpsons quotes, 45% Lebowski quotes, and 10% for the other unimportant stuff like remembering how to walk without falling over, eat using a knife and fork, and breathe through my nose. 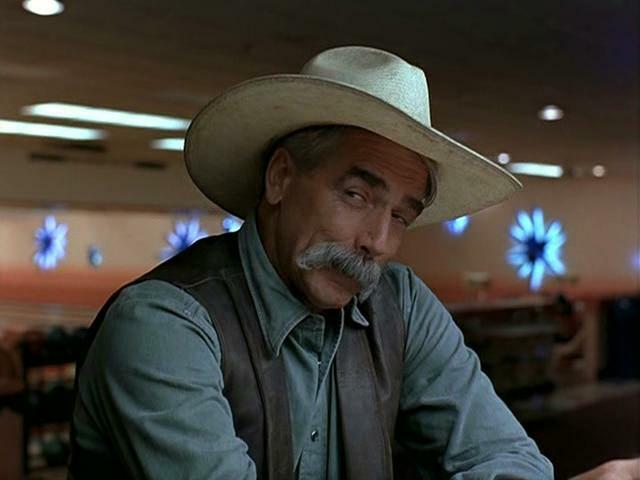 I can't think of many movies which have founded their own religions, annual conventions or which have acres of online space devoted to fans endlessly regurgitating choice quotes - but The Big Lebowski has all of that and more. As the Stranger says at the end of the picture, it's nice to know that the Dude is out there, taking it easy for all us sinners. I don't know about you, but I take comfort in that. "Chloë: So what do you do, Raymond? Ray: I... shoot people for money. Chloë: What kinds of people? Ray: Priests, children... you know, the usual. "